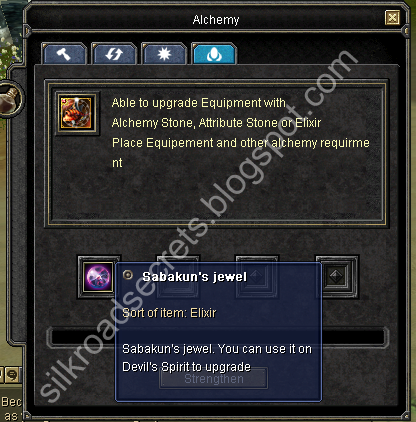 Silkroad Secrets: Pimp my Devil Spirit! For every +, the maximum HP and MP increase by 1%. From +3 to +5, the devil skill will change and give 25% damage increase as well as 15% speed increase. Also, a block ratio of 1 like a shield is added as a green (yes, green and not blue like on other equipment). The skill icon will change a little, but the character's look when using stays the same. You get an additional buff skill right to the devil skill which gives 300 second mob defense ignore probability (don't know how much). I guess it will still take some time until the update comes to iSRO, but you should look forward to it! Can the Devil Spirit Fail with elixirs or is it 100% chance to get +? I'm not sure about this yet because I only bought one jewel. I will probably test this later. i cant found in item mall can u add a ss in item mall ? It's not in the item mall, only in the webshop. whats the highest + on devil spirit? and is there a diffance in devil spirit S-Grade? 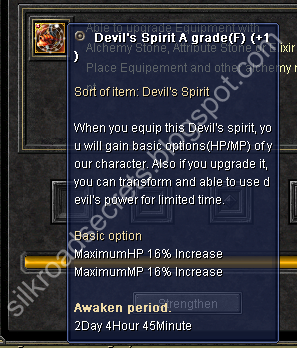 Yup... why devil spirit S grade got 20%hp/mp? while item mall devil spirit got 15% hp /mp? Maximum plus is basically unlimited. However you will not gain any new skills beyond +6. Also if you manage to pimp your Devil Spirit to +11, you will (probably) have no skills anymore at all (not included in PK2 anymore). Furthermore the Monster Ignore skill will change on +6 to "Lv 2" however the display string is incorrect but the effect linked in the PK2 increases from one to two. wen it fails can it be destoryed/lost from +5 to +6 like with gear without immortal? It can only go to +0 again, but the Devil's Spirit will not be destroyed. 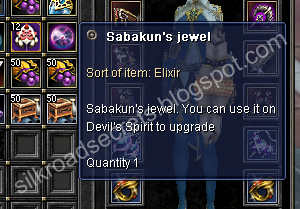 where do i buy the sabukan's jewel ?